Supercars has completed centre-of-gravity tests on 10 racecars following the Beaurepaires Melbourne 400, as part of ongoing processes which ensure parity between the competing marques. Ford’s Mustang has made a flying start to its debut season, scoring all six ARMOR ALL Poles and race wins across Adelaide and Albert Park. Rivals have questioned whether the new Ford has a lower centre-of-gravity (COG) than the Holden Commodore and Nissan Altima, allowing it to corner faster. The same argument was raised 12 months ago when the Commodore ZB debuted, winning seven of the first eight races. On that occasion, Ford and Nissan teams were permitted to homologate composite body panels to lower their COG; the first changes coming ahead of Albert Park. Overall minimum car weight, front-axle weight and the weight of many key components are mandated, with teams applying ballast where needed to meet the requirements. COG, which is a geometric position rather than a weight, is not mandated. 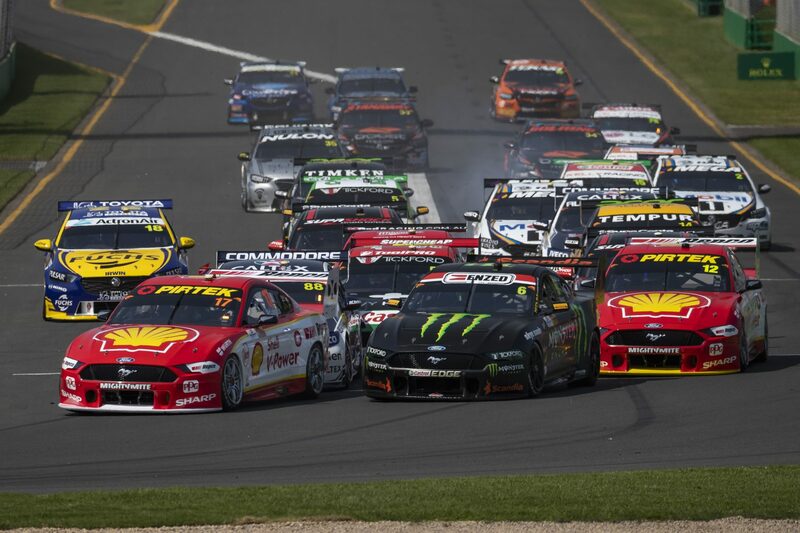 Across Monday and Tuesday, Supercars determined the COG of cars from DJR Team Penske, Tickford Racing, Triple Eight, Walkinshaw Andretti United, Garry Rogers Motorsport, Erebus Motorsport, Brad Jones Racing and Kelly Racing. The test took place utilising specialised equipment at Kelly Racing’s Braeside headquarters, capturing data that will now be analysed by Supercars’ technical staff and external partners. Confirming the test took place, Supercars’ head of motorsport Adrian Burgess says that if a discrepancy is identified, action will be taken. “There are well defined processes, mechanisms and resources in place to manage the category and ensure equitable competition,” he said. The cars from multiple Ford and Holden teams were COG tested due to the potential for differences between cars within the same brand.